Any vehicle requires an essential maintenance to keep it working properly. Among the periodic maintenance tasks that have to be carried out on any car we will find the service of the oil level and the rest of liquids, to change the oil after a recommended period o time, the renovation of the filters (air, inside, oil, petrol,... ), the service of the pressure and status of the tires,... , and many other tasks. It is difficult to remember all the dates and at what distance in kilometers we have to service some of the elements of our vehicle. Due to this, it is very practical to have an application like Vehicle Manager. 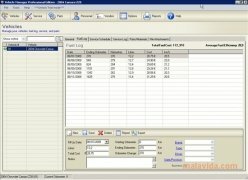 Vehicle Manager is a very easy-to-use vehicle maintenance manager. For each vehicle that we have it will generate a file with its data (make, model, year, color, starting kilometers,... ). After that, by filling in certain fields we'll obtain a complete analysis of the fuel efficiency, the service schedule with the dates, the products we need to buy, etc. To make inputting the data easier, the application has a vast service catalog and a complete material and component manager. The professional version allows a single user to manage up to a total of 50 vehicles. It's possible to evaluate this application, with the limit of a maximum of five recordings in each field.